When thinking about safety in the work place, it is absolutely critical to start with the hands. Over a million hand injuries occur in the workplace each year, with many of them causing a serious disability or even amputation. The most common type of injury is a laceration, which causes 63% of all disabling workplace injuries to the hands. Crushing accidents result in 13%, avulsion 8%, puncture 6%, and fractures 5%. Machines Functioning Unexpectedly – The #1 cause of hand injury is a machine that doesn’t perform as expected. This could be a saw that engages without warning, a press that drops unexpectedly, or any number of other things. Even if the machine is operating properly, it can still be unexpected for the employee working on the machine. Failure to Use Personal Protective Equipment – Wearing the right hand protection can help avoid most types of injuries. When working with a cutting machine or tool, cut-proof gloves should always be worn. If welding, heat/flame resistant gloves are essential. Always planning the right PPE for a job is absolutely critical. Not Recognizing a Danger – Employees experience injuries when they don’t recognize the presence of a danger. If a surface is hot, but there is no safety sign in place, someone may place their hand on it. Sharp objects, active machines, and all other dangers should be clearly labeled and identified to help avoid injuries. Improper Use of Tools – Using the wrong tool for a job significantly raises the risk of an injury. Using a hammer improperly, cutting with the wrong type of saw, and pulling parts out of a machine by hand rather than with a tool are all examples that can lead to a serious hand injury. Chemical Burns – When working with chemicals that can cause burns, irritation, or other injury it is necessary to take all possible precautions including wearing gloves and being aware of where emergency hand-washing stations are located. The risks to hands in the workplace are many, but there are a variety of great ways to improve safety too. Learning about different hand safety products and strategies can help reduce the risk in the workplace quite dramatically. 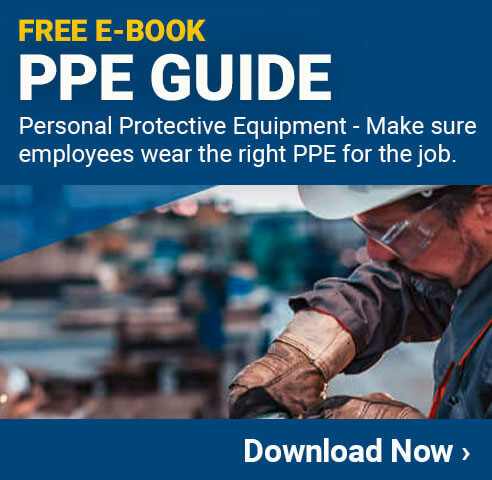 Personal protective equipment (PPE) is actually a required safety feature in many situations. Even where it is not legally required, however, it is a good idea to have safety gloves available to all employees. Training them on how to use the PPE properly is another important step in improving hand safety. Having set standards for specific jobs can help prevent risky behavior. For example, employees working on a machine press should have a process that requires them to use a reaching tool to add or remove a part from the machine. Another procedure could be to follow lockout/tagout standards whenever it becomes necessary to physically place the hand into the machine. One safety option that often goes overlooked is replacing traditional cutting tools with those that offer increased safety features. Some modern saws, for example, are able to detect when a hand or other body part enters the cutting area and will immediately stop the blade. Some hand tools also have safer blades that increase the safety of cutting boxes, cartons, and other materials in the workplace. There are many examples of cutting tools that offer safety features that can prevent cuts, or even amputations, in the workplace. Investing in these types of tools can help avoid costly accidents and injuries for your employees and the workplace. While there is a lot to think about when it comes to hand safety, it is well worth the effort. Hand injuries can result in serious disabilities for the employees, costly workers’ compensation claims for the employers, and extensive downtime for the workplace. Investing the time and resources needed to improve hand safety in the workplace is something all employers should be willing to do.